Candace Wark, professor of mechanical and aerospace engineering at Armour College of Engineering is currently exhibiting Viewing Silence, a collection of 17 original photographs depicting fluid mechanics in motion, in the Franklin and Wacker Lobbies of the Willis Tower. The exhibition is a collaboration between Wark and Shirley Nannini, who worked as a teacher, coach and administrator for over 30 years before reinventing herself by actively pursuing her passion for photography. The exhibit is free to view and will run until Friday, April 10, 2015. In their work, Wark and Nannini seek to break from traditional photography in order to focus on the examination of abstract shapes and forms. The artists explore the interaction of wind and light in order to capture the essence of wind movement and convey its transient nature. As part of their process, smoke is introduced into a wind tunnel and allowed to flow over various objects. 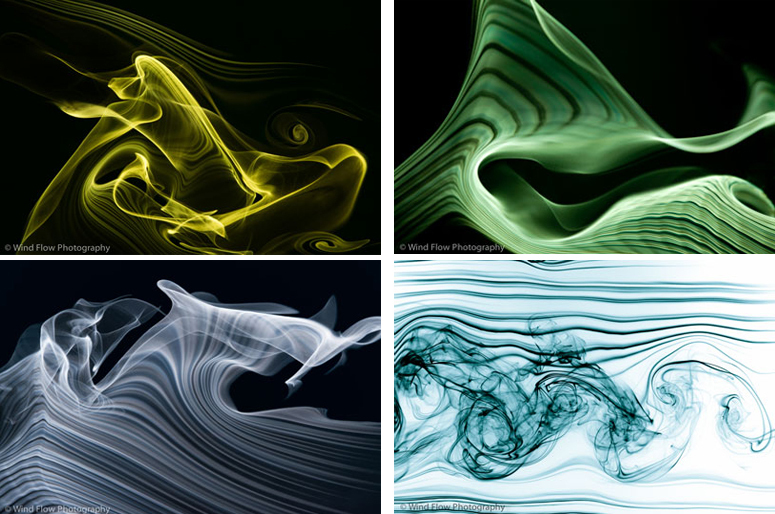 The interaction of the smoke and wind create ethereal patterns that owe their form to many factors including the speed of the wind, the progression of coherent fluid patterns, and the shape of the object. Through their photographs Wark and Nannini hope to draw the viewer into an evolving dynamic view of art and nature. Wark is a member of the Fluid Dynamics Research Center, a division of the Department of Mechanical, Material and Aerospace Engineering at Armour College of Engineering. The center continues the pioneering fluid dynamic research that began in the 1960s. Current research work is carried out through the use of advanced experimental and computational techniques, in areas such as unsteady aerodynamics, fluid – structure interaction, turbulence, hydrodynamic stability, and aeroacoustics. To learn more about Wind Flow Photography, click here.